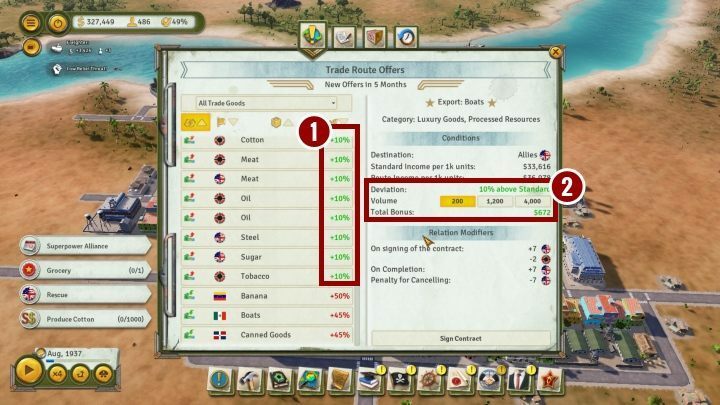 Making money is a very important aspect of Tropico 6. Thanks to money are able to build new constructions and pay your citizens for their work. In the early stages of the game you have to deal with limited finances. However, if you build the right buildings, you will quickly multiply your capital. At the beginning of the game, regardless of the age build Rum Distillery and start growing sugar. This will allow you to start producing rum. Due to the lack of training requirements and the high export price, you will have a regular cash inflow. Also sign trade agreements on a regular basis. All of them, which will allow you to gain from signing them, will have a green percentage . Thanks to them you can gain additional money on the goods you export at a given moment. You will be able to maximize your profit if you decide to sign a contract for as many goods as possible . Detailed information on trade agreements can be found in the chapter dedicated to them. If you don’t care about very good contacts with religious representatives of Tropico citizens, you can also issue a decree of Church Fee. Once introduced, citizens will have to pay tributes in religious buildings. This will guarantee further inflows to the Treasury. 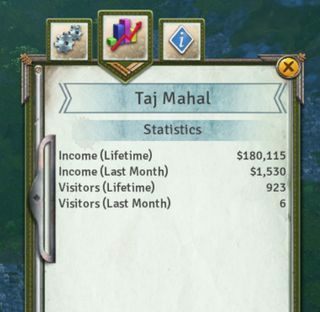 Revenue generated by Taj Mahal. You can also earn money on the wonders of the world. During World Wars, you will be able to place Commando Garrison. It will give you the opportunity to build the Taj Mahal. This construction means that every dying citizen will leave an inheritance in favour of the treasury.